The £18.3 million refurbishment and extension of the Carnegie Leisure Centre involved a complete strip out to the bare shell of a building originally opened in 1905. Working with Fife Council Asset and Facilities Management Services and main contractor Barr Construction, Laidlaw Solutions supplied 146 laminate-faced and postformed laminate Orbis Timber doorsets to the project. 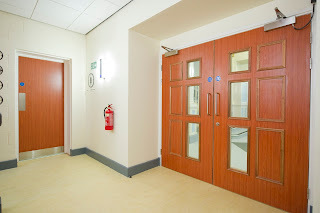 Specific design requirements included the provision of doors with specially moulded panels, together with 14 precision engineered Orbis Steel doorsets. These have a 50mm thick, reinforced door leaf which provides a fire resistance of up to 120 minutes and a 30dB acoustic performance. Orbis Commercial ironmongery in Satin Stainless Steel was fitted throughout in conjunction with a small number of nylon faced fittings. Internal refitting of doors formed part of a plan which involved taking down of most internal walls, rebuilding of all roofs and construction of a new two-storey steel structure within the outer shell. The Centre now boasts a 25 metre, six-lane swimming pool with moveable floor and new changing facilities, a purpose-built play centre, aerobic studios, and an 80-station fitness suite with steamroom, sauna and spa. Overall, an extra 1500 square metres of internal space has been added. Fife Council provided architectural services for the scheme, with Turner Townsend Project Management co-ordinating work. Externally, the existing building fabric has been completely upgraded, with remedial work done to existing stonework, windows replaced, all pitched roofs re-slated, an insulated render system applied and single ply membrane system overlaid on flat roof areas.